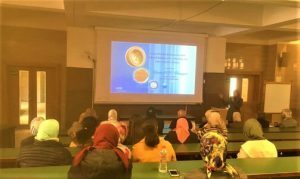 The faculty of Pharmacy and Drug Manufacturing held a seminar on the “Nanotechnology” on Tuesday, February 12, 2019. 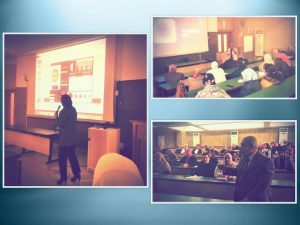 At the outset of the seminar, Prof. Maged El-Ghazouly, the Dean of the faculty of Pharmacy and Drug Manufacturing, gave some words about the profound importance of scientific research and the constant support the faculty lends to all its academic staff members during conducting their scientific researches; especially after the faculty afforded labs for nanotechnology and postgraduate researches. 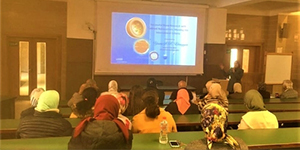 The keynote speakers of the seminar were a group of staff members from the department of Pharmaceutics, including Associate Professor Yousra Al Naggar, Dr. Wessam Al Refaey and Dr. Heba Hazaa who introduced the attendees to the nanotechnology applications which can be of a great benefit to all the departments of the faculty of Pharmacy and Drug Manufacturing.